Perfect for quick bursts in light training runs, the supremely lightweight Hoka Cavu 2 Women's Running Shoes will allow you to push for faster times and personal bests. Surrounding the upper of the shoe, the mesh is engineered to wrap the foot, allowing flexibility and breathability. Made from thin lycra, the material will provide you with an extreme comfort fit. The material is extremely lightweight, which contributes to the overall weight of the shoe by keeping it down. Hot air is easily able to escape through the layer of mesh, where it is then replaced by cooler air from outside of the shoe. This will mean that there will be a constant cycle working to keep your feet feeling comfortable in a controlled climate. The material is able to stretch, which will mean that in every stride that you take no matter what the size of it is, the material will react to it, reducing the risk of damage being caused to it. Covering the forefoot, the material is thicker, which will reduce the force from impacts directly to the toes. A heel counter will also make the heel feel firmer, improving the structure and protecting the rearfoot. Easy to adjust laces and a discreet flat-lying tongue will make it extremely easy to find a perfect fit. The ankle collar is extremely soft, which will reduce the chance of irritation being caused by rubbing and chafing. Inside the shoe, there is a seamless layer, which will sit next to the foot and won't cause any irritation by hotspots. 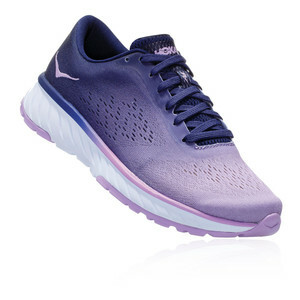 The midsole uses Hoka's developed PROFLY Midsole which will provide you with two benefits; an extremely soft cushioned landing as well as a responsive and springy propulsion toe-off. PROFLY is a dual-density midsole, with the heel and forefoot zones being different. As you land on the rearfoot, the cushioning immediately takes effect, absorbing the heavy impact from below and also cushioning the heel softly. As you roll your foot into the next movement, the EVA under the forefoot is extremely responsive, and will push you off extremely quickly, giving you an added zip. The feet will sit firmly in place, as the shoes use Hoka's Active Foot Frame technology. The shoe offers guidance without the need for posts or other constricting elements, and acts like a bucket seat in a race car by cradling and supporting your foot. The outsole on the shoe is made from rubber that is abrasion resistant, which will provide you with long-lasting grip and traction. The foam outsole is extremely lightweight, and when it comes into contact with the ground it immediately provides cushioning. As well as this, it is able to form a solid bond with a wide range of different surfaces, which will keep you in firm control. In addition to there being lugs and grooves, the shoe uses an X-shape design which will anchor the foot in place on wet ground, keeping you in firm control no matter what you are faced with underfoot. Thin Lycra Upper - Extreme comfort guaranteed. Lightweight - Material is extremely lightweight, keeping overall weight of shoe down. Breathable - Constant cycle of ventilation keeps the feet comfortable. Flexible Material - Material can stretch reducing chance of damage. Toe Protection - Thick material covers the toes for protection. Heel Counter - Firm heel walls protect the rearfoot. Easy Lacing - Easy to fasten and flat-lying tongue for comfortable fit. Ankle Collar - Soft feel against the ankle. Seamless Inner - Smooth next to skin comfort. PROFLY Midsole - Uses Hok's developed PROFLY dual-density midsole. Cushioned - Supreme cushioning on the heel. Responsive Toe - Responsive toe will give you an added spring in your step. Active Foot Frame - Feet sit in a curved seat for a controlled and cradled fit. Durable Rubber - Abrasion resistant rubber will increase lifespan of the shoe. Strong Grip - The shoe can form a solid connection with the ground. Deep Lugs - Digs into wet surfaces. X-Shape Design - Further secures the foot in place on every step.